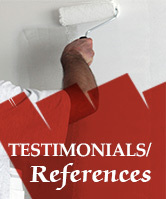 Read what your neighbors have to say about their experience with Lafayette Painting. Dave, Brian, and Pat were excellent workers. They were professional, conscientious, and careful. They were also pleasant and cheerful at all times and they cleaned up as thoroughly as possible at the end of each day. We are more than satisfied with the quality of their work. They are an asset to your business and we would readily recommend them. Thanks for a job well done. I cannot overstate how much we appreciated your entire team. The estimates were accurate. The work was completed carefully and in a timely way. We owe Dave, Brian, Pat, Jeremiah, and yourself a very big Thank You for making our home look great. Hope to speak to you early in the New Year to schedule 2012 projects. I've ben using Lafayette painting for the past 11 years. They're easy to book, the guys are friendly, professional, helpful and neat. Most of all, I always know that the job will be done perfectly and on time.